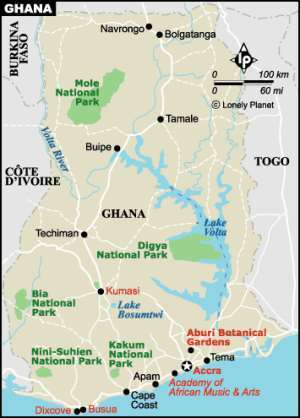 Ghanaians living in the diaspora should invest in tree planting alongside all the coastal villages of Ghana. If we do this exercise within 10 years all our coastal beaches would look like the typical tropical atmosphere that tourists love and our impoverish coastal areas will be flocked by tourists hence generating the foreign currency into our impoverish coastal towns . The diasporans who may come from a village along the coastal areas of Ghana will need to come together to build modern w/c toilets for ladies and gents, summer huts and beach deck chairs for 2 hourly slot rentals, huge summer hut for pizza, sandwiches, fast foods, drinks, and a play area for beach volley ball for people to unwind or chill out whilst on a stroll. All these areas need a sign post directing people from the streets to the beach. Then at the beach if there are no safe guards and life boats, it should be made clear on a notice board. It may be a good idea to invest in life guards at the beach to operate in case of an emergency. Individuals could be charged 15,000 per person. This money could be used as a salary for the life guards and dust bins which will be located at all angles of the beach preventing litter around. There should be signs for danger areas and danger times of the tide waves. Litter bins should be put in advantageous areas and kept clean. A patrol should be employed to monitor as cleanliness should be a priority. The sign should say "Carry your litter home or put your litter where appropriate bins are located. Tourists will pay good money for better facilities. Lighting will be essential if we want to encourage business during the night with live music to emulate sites along La, Nungua and elsewhere. Every town will need a tourists centre to guide the tourist and make them independent. Taxi drivers should have good unions and help the tourists by just being themselves. Every beach summer hut could have souvenirs shops. Summer huts could be a community-owned or owned by the church, family units or schools etc. So long as the community leader or chief and the local government is in control to ensure a smooth running of service and satisfying the tourists. First aid kiosk could be incorporated at the tourist centres. Coconut planting is a must along our coastal towns. We should look at the way Aburi gardens welcomes visitors as they enter in. It is what we have to emulate with coconut tree or royal palms. All the Ghanaian coastal areas may need to consider forming a co-operative community working in groups so that everyone within the coastal areas would contribute in the form of money or labour. People in the diaspora who come from these areas may need to consider how they could help to make a significant change in their areas. In the long run our future generations would thank us for these fundamental investments as they will never get hungry or thirst again. In an effort to speed up tree planting, our chiefs, churches, and we as individuals will need to plant a tree for the memory of our late parents or our ancestors for the community we claim we dearly love to blossom and flourish. Once we plant a tree we could put our names on the marble stone and have a living memory. All these ideas will boost our economy and create self worth and esteem of our people regardless of where they live. Mrs Mercy Adede Bolus (Chairperson of Agave development association) Views expressed by the author(s) do not necessarily reflect those of GhanaHomePage.